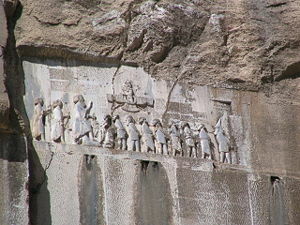 The Behistun Inscription, carved into a cliff side, gives the same text in three languages, telling the story of King Darius' conquests, with the names of twenty-three provinces subject to him. It is illustrated by life-sized carved images of King Darius with other figures in attendance. 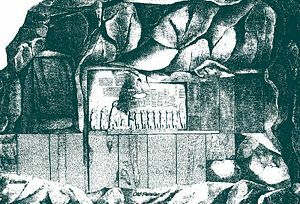 The Behistun Inscription (also Bisitun or Bisutun, بیستون in modern Persian; in Old Persian is Bagastana the meaning is "the god's place or land") is to cuneiform what the Rosetta Stone is to Egyptian hieroglyphs: The document most crucial in the deciphering of a previously lost script. It is located in the Kermanshah Province of Iran, and contains three versions of the same text, written in three different cuneiform script languages: Old Persian, Elamite, and Babylonian. Successive work by Georg Friedrich Grotefend, Henry Rawlinson, and others resulted in translation of the text by the mid-nineteenth century. Their efforts enabled many other cuneiform texts, preserved but undeciphered for centuries, to be translated, revealing much about the most ancient civilizations of human history. This is a significant step in the advancement of human knowledge and the understanding of ourselves and our past, and serves as an essential foundation for a better future. The text of the inscription is a statement by Darius I of Persia, written three times in three different scripts and languages: two languages side by side, Old Persian and Elamite, and Babylonian above them. The inscription described his accession in the face of the usurper Smerdis of Persia, and Darius' subsequent successful wars and suppressions of rebellion. Darius ruled the Persian Empire from 521 B.C.E. to 486 B.C.E., and some time around 515 B.C.E., he arranged for the inscription to be made. It was inscribed on a cliff near the modern town of Bisistun, in the foothills of the Zagros Mountains of Iran, just as one reaches them from the Kermanshah Plain. Modern day picture of the inscription. The inscription is approximately 15 meters high by 25 meters wide, and 100 meters up a limestone cliff from an ancient road connecting the capitals of Babylonia and Media (Babylon and Ecbatana). The site itself is extremely inaccessible, as the mountainside was removed to make the inscription more visible after its completion. The Old Persian text contains 414 lines in five columns; the Elamite text includes 593 lines in eight columns and the Babylonian text is in 112 lines. The inscription was illustrated by a life-sized bas-relief of Darius, holding a bow as a sign of kingship, with his left foot on the chest of a figure lying on his back before him. The prostrate figure is reputed to be the pretender Gaumata. Darius is attended to the left by two servants, and ten one-meter figures stand to the right, with hands tied and rope around their necks, representing conquered peoples. Faravahar floats above, giving his blessing to the king. One figure appears to have been added after the others were completed, as was (oddly enough) Darius' beard, which is a separate block of stone attached with iron pins and lead. It is believed that Darius placed the inscription in an inaccessible position to make it tamper-resistant. Readability took second place to this demand: The text is completely illegible from ground level. The Persian king did not account for the creation of a pool of water at the bottom of the cliff, which brought increased human traffic to the area, leading to considerable damage being caused to some of the figures. The first historical mention of the inscription is by the Greek Ctesias of Cnidus, who noted its existence some time around 400 B.C.E., and mentions a well and a garden beneath the inscription dedicated by Queen Semiramis of Babylon to Zeus (the Greek analogue of Ahura Mazda). Tacitus also mentions it and includes a description of some of the long-lost ancillary monuments at the base of the cliff, including an altar to Hercules. What has been recovered of them, including a statue dedicated in 148 B.C.E., is consistent with Tacitus' description. Diodorus also writes of "Bagistanon" and claims it was inscribed by Queen Semiramis. After the fall of the Persian Empire and its successors, and the loss of cuneiform writing, the nature of the inscription was forgotten and fanciful origins became the norm. For centuries, instead of being attributed to Darius—one of the first Persian kings—it was believed to be from the reign of Chosroes II of Persia—one of the last. The transcription kept it's wondrous aura, however, and a legend arose found in the book of Chosroes and Shirin that states that Farhad, a lover of Chosroes' wife, Shirin, was the one who moved half the mountain away as this was part of his punishment for his transgression. He died, but was also credited with being the source of a tree with fruit that will cure the sick. It is unknown, however, if anyone has been cured in the pool at the inscription. The inscription was noted by an Arab traveler, Ibn Hawqal, in the mid-900s, who interpreted the figures as a teacher punishing his pupils. It was not until 1598, when the Englishman Robert Sherley saw the inscription during a diplomatic mission to Persia on behalf of Austria, that the inscription first came to the attention of western European scholars. His party came to the conclusion that it was a picture of the ascension of Jesus with an inscription in Greek. Biblical misinterpretations by Europeans were rife for the next two centuries. French General Gardanne thought it showed Christ and his twelve apostles, and Sir Robert Ker Porter thought it represented the twelve tribes of Israel and Shalmaneser of Assyria. Italian explorer Pietro della Valle visited the inscription in the course of a pilgrimage around 1621, and German surveyor Carsten Niebuhr visited it around 1764, while exploring Arabia and the middle east for Frederick V of Denmark, publishing a copy of the inscription in the account of his journeys in 1777. Niebuhr's transcriptions were used by Georg Friedrich Grotefend and others in their efforts to decipher the Old Persian cuneiform script. Grotefend had deciphered ten of the 37 symbols of Old Persian by 1802. In 1835, Sir Henry Rawlinson, a British army officer training the army of the Shah of Iran, began studying the inscription in earnest. As the town of Bisistun's name was anglicized as "Behistun" at this time, the monument became known as the "Behistun Inscription." Despite its inaccessibility, Rawlinson was able to scale the cliff and copy the Old Persian inscription. The Elamite was across a chasm, and the Babylonian four meters above; both were beyond easy reach and were left for later. 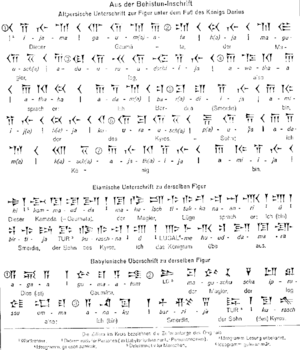 Armed with the Persian text, and with about a third of the syllabary made available to him by the work of Grotefend, Rawlinson set to work on deciphering the text. Fortunately, the first section of this text contained a list of Persian kings identical to that found in Herodotus, and by matching the names and the characters, Rawlinson was able to crack the form of cuneiform used for Old Persian by 1838, and present his results to the Royal Asiatic Society in London and the Société Asiatique in Paris. Next came the remaining two texts. After a stretch of service in Afghanistan, Rawlinson returned in 1843. Using planks he crossed the gap between the Old Persian text and the Elamite, and copied the Elamite text. He was then able to find an enterprising local boy to climb up a crack in the cliff and rig ropes across the Babylonian writing, so that papier-mâché casts of it could be taken. Rawlinson set to work and translated the Babylonian writing and language, working independently of Edward Hincks, Julius Oppert and William Henry Fox Talbot, who also contributed to the decipherment; Edwin Norris and others were the first to do the same for the Elamite. As three of the primary languages of Mesopotamia, and three variations of the cuneiform script, these decipherments were one of the keys to putting Assyriology on a modern footing. The monument tells of the ancient glory of Persia when she was the supreme power in the world, before Darius was defeated by the Greeks in 490 B.C.E. at Marathon. The English translation of the text begins with the genealogy of Darius, traced direct to Achaemenes, and then refers to the reign of Cambyses, who had preceded Darius, the murder of Smerdis (the brother of Cambyses), and the revolt of the Persians during the absence of Cambyses on his campaign in Egypt. At this moment, Gaumata, also called "the great pretender" and the Magian, seized his opportunity. He declared himself to be Smerdis, the son of Cyrus, with a claim to the throne. Cambyses hastened homeward, but died on the way, and Gaumata, as the Babylonian contract tablets show, held sway for a brief period. It was Darius, the son of Hystaspes, who challenged the usurper, and with a small force, slew him and took the throne. Revolts broke out in many of the provinces, and the first years of Darius were spent in subduing them. Nidintu-Bel seized Babylon, claiming to be Nebuchadnezzar; Martiya headed a revolution in Susiana: In Media, Phraortes gave himself out to be Khshathritha, of the family of Cyaxares, and led another revolt. These were all dealt with successfully, and all these unfortunate "pretenders" are to be seen on the sculptured panel above the inscription. The king stands with his arm raised and his foot on Gaumata; behind him are his generals or satraps. Before him, roped one to another, come the recalcitrant chiefs in the following order: Atrina, the first Susian pretender; Nidintu-Bel, of Babylon; Fravartish (Phraortes), of Media; Martiza, the second Susian pretender; Citrantakhma, of Sagartia; Vahyazdata, the second pseudo-Smerdis; Arakha, the second Babylonian pretender; Frada, of Margiana; and afterwards, even though it destroyed part of the Susian inscription, Skunkha, the Scythian, in his high peaked hat was added. Later expeditions, in 1904, sponsored by the British Museum and led by Leonard William King and Reginald Campbell Thompson and in 1948, by George G. Cameron of the University of Michigan, obtained photographs, casts, and more accurate transcriptions of the texts, including passages that were not copied by Rawlinson. It also became apparent that rainwater had dissolved some areas of the limestone in which the text is inscribed, while leaving new deposits of limestone over other areas, covering the text. The monument suffered some damage from soldiers using it for target practice during World War II. Later, Iranian archaeologists began undertaking conservation works. The site became a UNESCO World Heritage Site in 2006. Cameron, George G. 1950. "Darius Carved History on Ageless Rock." National Geographic Magazine, Vol. XCVIII, No. 6, 825–844. Retrieved March 20, 2007. Payvand's Iran News. Iran's Bisotoon Historical Site Registered in World Heritage List. Retrieved March 20, 2007. Rawlinson, H.C. 1953. Archaeologia, Vol. XXXIV, 74. Thompson, R. Campbell. 1937. "The Rock of Behistun." Wonders of the Past, Vol. II. New York: Wise and Co. 760–767. Retrieved March 20, 2007. The Behistan Inscription English translation of the inscription text; Tolman, Herbert C. 1908. The Behistan Inscription of King Darius. Nashville, TN: Vanderbilt University. Brief description of Bisotun UNESCO. This page was last modified on 13 December 2016, at 17:42.